An investigative report in Cleveland’s <I>Plain Dealer</I> November 27 makes it plain why large corporate animal farms are terrible neighbors—and why communities that welcomed them in often regret their decision. Marine conservation activists were dismayed to learn last week that the Bush administration is unlikely to institute recommended policy changes regarding the way it handles ocean pollution, coastal development, fisheries management and other marine environmental issues. The White House is mandated to officially "respond" by December 20 to recommendations set forth by the U.S. Commission on Ocean Policy last year. Environmentalists are bracing for stepped-up efforts by a re-elected Bush administration to dramatically increase logging of old-growth trees and other forestlands in the Pacific Northwest over the next four years. Dear Earthtalk: My new dishwasher has receptacles for both soap and "rinse-aid." Is rinse-aid safe for the environment, and do I need to use it in my dishwasher? Dear Earthtalk: With all the talk of hydrogen fueled vehicles, I can’t help but wonder if millions of cars driving around spewing out water vapor—a well-known "greenhouse gas" itself—is any better than the carbon dioxide emitted by traditional cars? New York’s Republican governor, George Pataki, is really tall, and he towered over the compact Honda FCX fuel-cell car he was admiring. While the busy Pataki passed up the chance to take a ride in one of the two cars that had just been presented to the state, I didn"t.
Doctors from the University of California and the Boston Medical Center have released findings linking common chemical pollutants to at least 200 different human diseases. The study, which compiled data from hundreds of previous studies, shows strong correlations between various common pollutants and a wide range of diseases, including asthma, testicular atrophy, cerebral palsy, kidney disease, heart disease, hypertension, diabetes, dermatitis bronchitis, hyperactivity, deafness, sperm damage and Alzheimer’s and Parkinson’s diseases. Pollutants also were linked to 37 different types of cancers. A recently released study of commuters in Shanghai, China shows that walking or bicycling to work may do more than minimize pollution and improve cardiovascular health. Researchers from the Maryland-based National Cancer Institute found that moderate day-to-day physical activity significantly reduced Shanghai residents’ chances of getting colon cancer. 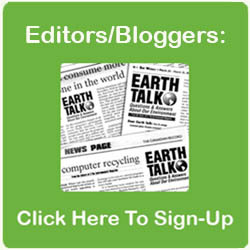 Dear EarthTalk: What environmental and health problems are associated with the use of chlorine by the paper industry? Is chlorine really essential in the production of paper? Dear EarthTalk: I’ve heard about mad cow disease, but what is mad deer disease?